As a police detective, Mike Hoolihan does not know much about Schrödinger’s Cat and the Heisenberg Uncertainty Principle, but she has an intuitive understanding of how the act of observing holds consequences (yes, she is a she). 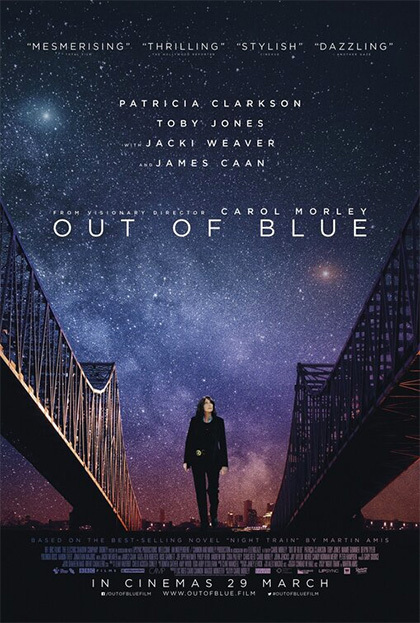 Her investigation into the death of a popular astronomy professor will involve a piecemeal education in quantum mechanic during Carol Morley’s Out of Blue, which opens this Friday in New York. Hoolihan has lived hard and copped hard. She is a case-closing machine, but she refuses to investigate the memory holes shrouding her own early years. The shooting of Jennifer Rockwell would just be another workaday case for her, except the deceased was the daughter of powerful city councilman Col. Tom Rockwell. Early suspects include the victim’s colleagues, Prof. Ian Strammi and Duncan Reynolds, who both keep prattling on about Schrödinger’s Cat. Of course, Hoolihan is more interested in the case’s similarities with a notorious serial killer, who terrorized New Orleans decades prior. 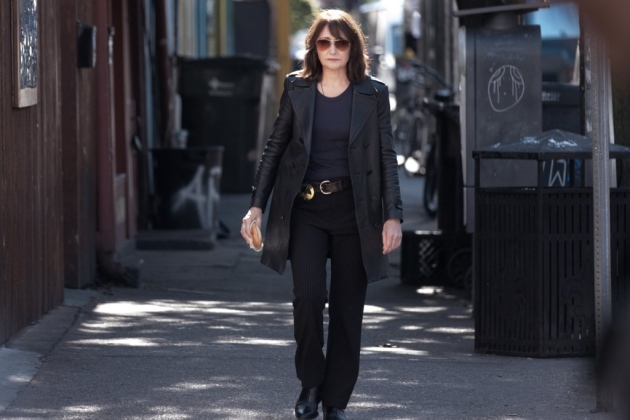 Out of Blue (deliberately missing the article) is probably the haziest, most narratively diffuse police procedural this side of the postmodern novels of Alain Robbe-Grillet. Unfortunately, most of the references to astronomy and quantum mechanics feel like a pompous, scientistic overlay, instead of an organic function of the narrative. Frankly, just about every aspect of the film feels like it is trying too hard, except Patricia Clarkson, who is just effortlessly hardboiled and broken down. She could pass for the more mature version of Nicole Kidman’s Erin Bell, fifteen or so years after the events in Destroyer. Even though the cosmic mumbo jumbo really doesn’t work, Johnathan Majors still does a nice job of selling them as Reynolds (the real fault lays with Morley, who never lays the proper foundation or establishes sufficient context). James Caan is clearly on familiar ground as Col. Rockwell, but he is still highly functional in the part, even if he never pushes himself. However, Jacki Weaver brings some impressive nuttiness (even by her past standards), as the bereaved mother, Miriam Rockwell. Page to screen adaptations do not get much looser than Morley’s treatment of Martin Amis’s short novel Night Train, but as a one-two punch with London Fields, it should pretty much dissuade any cinematic takes on the sly writer’s work, for at least the next ten years. As of now, he is looking pretty unadaptable. However, Morley made several inexplicable choices, including replacing the title instrumental blues song with Brenda Lee’s “I’ll Be Seeing You,” which is a little too on the nose, lyrically. On the other hand, the use of The Church’s “Under the Milky Way” over the closing credits is downright inspired. Admittedly, cosmic dimensions of Out of Blue sound cool and distinctive, but the execution doesn’t come together. Morley (best known for the massively depressing hybrid documentary, Dreams of a Life) never exhibits full command of her material, but Clarkson is right on the money, proving she is still one of the best in the business (even in flawed vehicles). It just really ought to be better. Anyone intrigued by its ambitions should wait until it pops up on free streaming platforms, which should be sometime soon after it opens this Friday (3/22) in New York, at the IFC Center.